I can't believe that my birthday is less that 2 weeks away! I guess it is true when they say time goes by faster the older you get! It's hard to believe that I am about to turn 23. 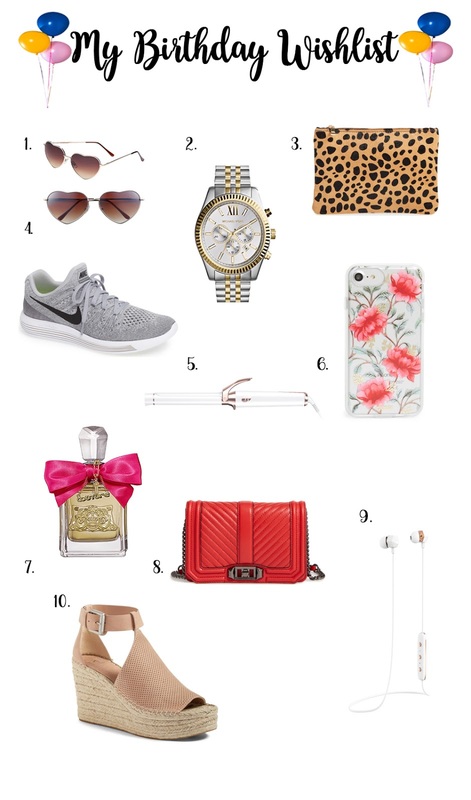 Anyway, I put together some things I'd love to get for my birthday. Enjoy! 1. BP. Heart Shaped Sunglasses- How cute are these sunnies?! So fun! I'd be wearing these all summer long, thats for sure! 2. Michael Kors Large Lexington Chronograph Bracelet Watch- I have wanted this watch for sooo long! I just like silver and gold together, so you it doesn't matter what kind of earrings or bracelets yo pair it with! 3. BP. Leopard Print Genuine Calf Hair Pouch- Im obsessed with this leopard print clutch! You know it is the perfect dupe for THIS Clare V. one- which I've practically drooled over ever since I first saw it! 4. Nike LunarEpic Low Flyknit 2 Running Shoe- I am in desperate need of a new pair of running shoes! I really like how these are more neutral and not flashy and bright! 5. T3 Curling Iron- Ya'll. I want this curling iron SO bad! I have heard amazing things about it!! I just wish it wasn't so expensive! 6. Sonix Mandarine Bloom iPhone Case- Love the floral print on this case! 7. Viva La Juicy- My fave perfume!! I will never get tired of this scent! Love it! 8. Rebecca Minkoff Small Love Leather Crossbody Bag- I have been wanting a new RM bag for sometime now. I use the one I have all the time. They are such great quality! This one comes in a few other colors as well. 9. Happy Plugs Wireless Bluetooth Ear Phones- I have been wanting some wireless earphones for when I am working out! I am so picky on how they look though. I am glad I found these. I really like the white! 10. Marc Fisher LTD Annie Perforated Espadrille Platform Wedge- This blush color is such a cute color for summer! I know like every other blogger is wearing them, but they are just so stylish and cute!